Is Adult Orthodontics Right For You? If you have gone to the dentist before with recurring problems, chances are the dentist has mentioned adult orthodontics as a solution to having to come back with the same issue. This is because many teeth are at risk because they stand at a funny angle and cannot be properly cleaned. A well-adjusted row of teeth is even and easy to clean, with plenty of spaces for you to floss most of your teeth with ease. Upon hearing this mentioned, most adults will laugh it off as something that is too late, too expensive, too embarrassing or too time consuming. We will dispel these notions today by looking at each of these statements in detail. 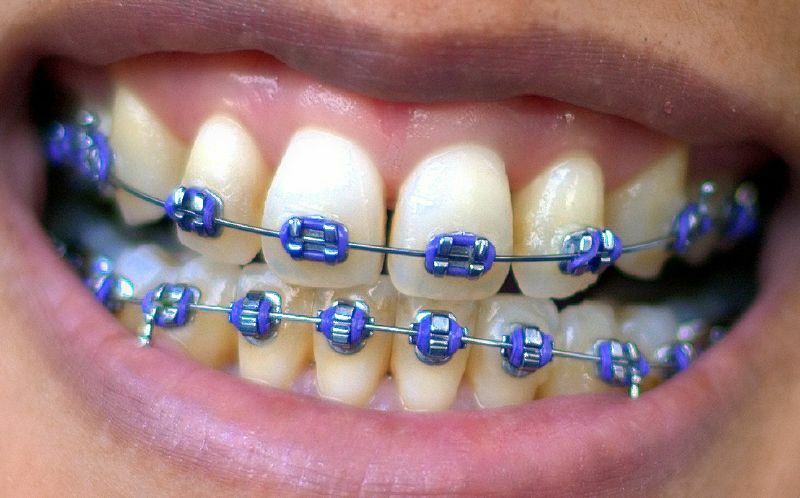 Colourful brackets liven up braces! Although it is true that adult orthodontics takes longer than orthodontics for children (paediatric orthodontics), it is not too late to start. If you feel you can benefit from straighter teeth, if you have recurring problems with the same tooth or teeth, if you think your smile could improve, then as long as you have teeth, it is not too late for orthodontic treatment, especially because getting it means you can keep your teeth for longer. Because treatment time is longer for adults, the price of orthodontic treatment s also going to be a little bit more. But even if you are on a budget, what costs more: orthodontic treatment, or running to emergency appointments with increasing frequency to get root canals, painful extractions and inevitably false teeth or dental implants? With most clinics engaging in payment plans that allows for a pay as you go system, there are many enticing financial solutions for more affordable orthodontic care. The notion that orthodontic braces are only for kids and pre-teens is being dispelled day in and day out, as more and more adults, professionals with careers, are turning to adult orthodontic treatment. Time issues are the same> it is just a 15 minute appointment once a month, which most people are able to keep, even with the overloaded schedules we are seeing these days. And with removable clear aligners, aesthetic braces, tooth coloured and sapphire brackets that are nearly invisible, and lingual braces that are placed on the backside of the teeth and are actually totally undetectable, orthodontic treatment has never looked more enticing for adults. Why not talk to us, come in for a consultation and see what we can do for you!